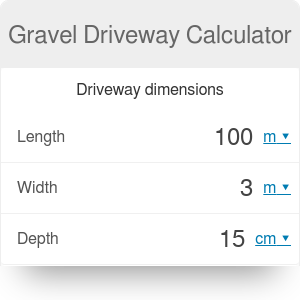 Gravel driveway calculator is a useful construction tool that calculates how much crushed stone is needed to build a gravel driveway. If you want, it can also estimate the needed material weight and total gravel driveway cost. Stop wondering how much gravel you should buy, and focus only on choosing the best gravel for the driveway. In the article below you can find additional information about what is gravel and a few factors that may influence the gravel driveway cost. Moreover, we prepared a step by step tutorial of proper calculator usage. Gravel driveways are very popular in some areas, and very hard to find in others. In the countryside, crushed stone is commonly used to build both driveways and roadways. You can often see gravel driveways leading to concrete garages. Why are they so popular? For example, because you will build a gravel driveway cheaper than a paved driveway, but it will last just as long. Moreover, that will be a good choice if you don't mind to do extra maintenance. Natural gravel can be technically defined as loose rock or stone, with dimensions larger than sand but smaller than a cobble. The diameter may vary from 2.5-6.5 cm (0.1-2.5 in). Gravel, commonly used for building driveways is often a processed product, consisting of rocks, sand, and clay. This mixture compacts much better into a stable surface than plain rocks. No matter if you need to build a local driveway to a single-family house or an access road to a building site, the gravel driveway calculator will help you in both situations. This user-friendly tool requires from you only to enter the dimensions of a planned driveway. If you are curious about the costs of needed crushed stone, you should also provide the price of a material. Moreover, you can check what is the total weight of the material. We assumed the standard weight of gravel equals 1.25 tonnes per cubic meter, but you can change it in case of using a different type of crushed stone. Whether you want a basic gravel driveway or something more stylish, multiple factors affect the cost. Depending on the condition of the site and its size, land clearing may be required. To do this task yourself, you will for sure need to rent appropriate gear or hire professionals who will do this faster. You can choose from various types of stone - more solid and nicer will cost you much more than basic gravel. Of course, the crushed stone volume needed to build the driveway will have the most significant influence on the total cost. Keep in mind, though, that you should take care of some other factors such as proper drainage. This also costs additional effort and money as a consequence. But if not installed right the first time around, it could lead to higher maintenance costs in the future. Gravel Driveway Calculator can be embedded on your website to enrich the content you wrote and make it easier for your visitors to understand your message.